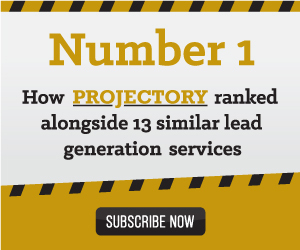 One in four Projectory subscribers using the project market intelligence service for 12 to 24 months have won on average $143,000 in work thanks to Projectory. A subscriber survey in November 2018 further revealed that of all subscribers who had won contracts the average total value of contracts won was $865,000. The median total value of contracts won was $250,000. Projectory publisher and content director Jamie Wade said the survey of 180 individual subscribers showed that a subscription to Projectory was a highly worthwhile investment. In the last 12 months Projectory has reported on 906 unique active and emerging projects in Australia with a capital expenditure of more than $30 million in the resources, construction, infrastructure, energy and utilities, industrial and defence sectors. In the same period Projectory identified and provided the contact details of more than 3225 unique project contacts. The survey revealed that more than half of subscribers have developed new business relationships thanks to Projectory while 37 percent have tendered for additional work thanks to Projectory. The survey also revealed that Projectory was saving users on average 16 hours a month sourcing business opportunities and contacts with major projects in Australia. On average subscribers said they had developed on average seven new business relationships as result of the information from Projectory. On several measures subscribers rated timeliness of information on Projectory highest followed by scope of projects covered and reliability of information. Subscribers also rated Projectory highly on the accuracy of contacts, key contact details and procurement protocol reported. Tarryl Hektner a subscriber with Severn Glocon who recently moved to Australia from Canada said Projectory had opened up new project opportunities and provided valuable contact information. “Without this contact information, I would be required to do all the ground work myself to find out who the key people on each project, that would take hours!” he said. Banlaw global account manager Scott Kelly whose company provides provides fuel management solutions said Projectory had been very beneficial. “Banlaw has seen great company planning and advances using the long lead and correct information provided over a long period of time,” he said. EnerMech senior business development manager Todd Armstrong said Projectory was by far the quickest way to get to operational decision makers. “Projectory not only provides precise detail of relevant projects, they drill down and quite often provide direct contact details of the active people running the projects,” he said.